If one had the time, if one were able to perceive life and its screens on a multiple level, if one were gifted to grasp the many entirely rounded up festivals within this one festival, the (special, dear, exceptional) International Film Festival Rotterdam (IFFR), one could have started with something extensional and experimental like this: Lav Diaz’s Kagadanan sa banwaan ning mga engkanto (Death in the Land of Encantos), the 540-minute docu-fictional account of a region on the Philippine islands struck by the incredibly strong hurricane Durian in December 2006, a story, loosely knit around the existentially and politically active poet Benjamin Agustan who returns to his devastated native soil after a long stay in Russia, written and directed by Lav Diaz, this wonderful charming contemplative lonely hero who again and again seems to return to his morally and economically shattered home country as if after several longer stop-overs on a completely different (cinematographic) planet. Or with this: Standing Up, Waise Azimi’s second trip (and voluntary embedment) into the heart of darkness of Afghanistan (still and involuntarily at war), a 120-minute (also) Philippine documentary shot in Camp Alamo, the training camp of the allied forces, a serious, harsh, yet unemphatic attempt in realising who they are, these men shaping this War Against Terror on both sides (soldiers here, refugees and unemployed recruits there), a sociologically clear cut picture of a life we usually have no access to, deliberately interrupted by very personal reflections. Or with this: one part of the “Exploding Cinema” section (the framework for the transgression of cinema and its black-box and one-screen-limits as a framework), an intersection of film and art, a series of videos and installations called New Dragon Inns, including works by the Thai master-dragon Apichatpong Weerasethakul (plus some more or less newly introduced names like Uruphong Raksasad, Jakrawal Nilthamrong, Nitipong Thintuphthai, Thunska Pansittivorakul and Thaweesak Srithongdee), some smaller Chinese-Taiwanese border- and gender-crossings as well as a large number of longer videos by Thai, Taiwanese and mainly Chinese artists – the most outstanding of which being Yang Fudong’s Seven Intellectuals in Bamboo Forest Part 1-5 (229 min.) and Wang Bing’s two hallmarks in political filmmaking of respectable length, He Fengming (Fengming, a Chinese Memoir, 186 min.) and Cai you ri ji (Crude Oil, 840 min.). In Rotterdam you start counting days, hours and minutes, you work out short cuts between the theatres, you want to be here and there and everywhere, you realise how precious the time of life and its screens are. You didn’t want to miss the sensational comeback – as a free man, as a filmmaker – of the former Japanese Red Army- and pro-Palestine terrorist Adachi Masao with his wild, fierce, angry, gross, nasty and sadly enough not entirely fictional, or rather not entirely phantasmagorical behind-the-bars physio-psycho torture-drama Yuheisha/Terorisuto (The Prisoner/Terrorist), which is Adachi’s own story in a way, but actually based on another real hero, Okamoto Kozo, also a member of the Red Army and still living underground in Lebanon; a film, recalling the times when avant-garde and extreme politics could go hand in hand, when trash and splatter met critical notions on a highly repressive system and lead to a kind of insanity, simply unimaginable elsewhere and elsewhen. You also didn’t want to miss the other exceptional and other extreme of Japanese psychoanalysis on film (in a way…), Kobayashi Masahiro, whose latest Locarno-winning film Ai no yukan (The Rebirth), a very special love story in more or less complete silence, therefore in an utterly (nearly hurting) precise body language (plus communication via culinary rituals), starring the master himself in the main role, stood miles out of the rest of his nevertheless quite interesting oeuvre which was shown in one of the Film Maker in Focus portraits. You wanted to get familiar with some new names in documentary filmmaking like Mahmoud al Massad (Recycle), Anna Hoffmann (Welche Richtung geht’s nach Hause?/Where Is That Home Now? ), or Takefuji Kayo (Hanshin hangi/Half Empty or Half Full) – and you didn’t regret either of the choices. Recycle is an investigative and powerful video painting of Abu Amar, an ex-mujahideen, and of Zarqa, the Jordan city where the former Al Qaeda leader Abu Musab al Zarqawi was born and where, until today, many recruits to the jihadist cause come from. If al Massad, born in Jordan in 1969 and an emigrant since 1988 (living in the Netherlands since 1995), went back to a familiar yet politically and socially different hometown to shoot Recycle, Anna Hoffmann, a 28 year-old “German Russian” from Kazakhstan, had left her Central-Asian background at the age of ten (shortly after the break down of the Soviet Empire) in order to study film and theatre in Germany. This wonderful personal documentary road-movie of her “essay” to return back to one’s roots (her roots, her father’s roots, her uncle’s roots), Welche Richtung geht’s nach Hause?, is an astonishing honest examination of family and cultural bonds, intimate and sincere, yet never too private; it offers beautiful, sometimes metaphorical visuals of an estranged but beloved landscape. One striking aspect in Hoffmann’s film, the intensity with which conversations between generations can take place, may also be considered the generic element in Takefuji Kayo’s Half Empty or Half Full, the docu-fictional account of a young female filmmaker meeting an old paralysed man who turns out to be a former filmmaker, too. There is great filmic artistry and mastery in both, the way these two get acquainted with each other as well as in the film-in-film being produced during the shooting of the documentary. All three films are reflections on the connection of memory, oblivion and filmmaking, they convey a sense of loss, emigration, and change. Getting in the mood of watching documentaries – which in Rotterdam is always connected with a certain sportive competition in catalogue-reading (the festival intentionally does not divide the landscapes of film into feature and documentary) – you, of course, wanted to trace the latest turns and developments of experienced and experimental auteurs. Rithy Panh’s Le papier ne peut pas envelopper la braise (Paper Cannot Wrap Up Embers), for instance, the shocking, warm, and deliberately half staged portrait of young prostitutes in Phnom-Penh. Michael Pilz’s A prima vista, a structurally surprisingly “narrative” and autobiographic poem in Super-8, the selective and randomly organised looking back of a man of growing age on his many lives and paths. Garin Nugroho’s Teak Leaves at the Temples, a film that sets out as a simple music documentary of a concert by the free-jazz trio, especially performed for the film, but turns into something completely different – the very special Nugrohian way of intermingling local history and culture of Java, its spiritual rituals and traditional music, ethnographical information, everyday life, etc. with the plot of a film – following up (and maintaining some stylistic features of) the Indonesian master’s grand Opera Jawa (2006). Ken Jacobs’ RAZZLE DAZZLE the Lost World, a prime example of his virtuosity and metamorphotic qualities, or James Benning’s Casting a Glance, another prime example of forming and shaping a certain auteur-cinema, this time the minimalist and steady study of Robert Smithson’s famous landscape artwork Spiral Jetty. Another famous experimentalist’s latest oeuvre, the much discussed Mogari no mori (The Mourning Forest) by Kawase Naomi, testing again the unstable borders between document and fiction, this time by alienating a forest in which two souls get lost. Maria Ramos’ Juizo (Behave), the impressive (and sometimes hardly bearable in terms of absurd punishing methods) follow up of Justice (2004), her prize-winning documentary on the Brazilian judicial system. Or Sergei Loznitsa’s Predstavlenie/The Revue, a sensational footage film based on archive newsreel and propaganda material, dealing with Soviet social and cultural politics of the ‘50s and ‘60s; Loznitsa’s extraordinary handling of the material and its sensual qualities as well as his montage skills make this film a highly informative source for the exploration of the ambiguous nature of official and everyday life in the USSR. The promotion of Sergei Loznitsa, this major talented Russian filmmaker, might also be regarded as significant for a general tendency of Rotterdam’s programming policies, displaying not only the widely acknowledged and favoured (nearly “expected”) focus on Asian cinema, but also revealing a strong orientation and intense research activity in Russia and the countries of the former Soviet Union. For those with a special interest in Eastern European Cinema, this course could be clearly observed during the last few years already, in 2008, however, it became a real chance and challenge for a broader audience. Besides Loznitsa’s little “Belorussian brother”, Viktor Asliuk, whose humble petit masterpiece Maria reflects the depressive (his- or rather her-)story of a former socialist “best worker”, or the Ukrainian artist’s Ihor Podolchak’s visually intense essay in artistically recreating a claustrophobic family atmosphere Las meninas, one could finally see three mature masterpieces of contemporary Russian cinema side by side, its experienced wing, so to speak, the outstanding triangle Balabanov-Sokurov-Muratova, not the much appraised – sometimes a bit prematurely, as it turns out – young wave (Popogrebsky, Khlebnikov, Zvyagintsev), favoured by those who had been waiting all too long for a simple, free, which ever – light or heavy, but definitely always average European type of arthouse cinema from the generation bearing no longer the stigma of the former USSR. I think it shows of great insight that the IFFR (besides its unquestioned, daring and encouraging policy to advance talented newcomers mostly before they are acknowledged anywhere else) at the same time persistently, nearly stubbornly continues to focus on directors who, judging from certain representation strategies displayed by official Russian film institutions and politics, are by far not everybody’s darlings any more (if they ever were): at the Kinotavr, the Open Russian Film Festival in Sochi, for instance, three main prizes were given to Alexei Popogrebsky’s Prostye veshchi (Simple Things), whereas Aleksei Balabanov’s outstanding chef-d’oeuvre Gruz 200 (Cargo 200) got none (officials hate the film, it brings disgrace, disgrace, and again, disgrace on Russia). Thanks to this maybe even more daring Rotterdam attitude to not turn its back on formerly big names, these in a sense paradoxical outlaws were given their deserved public appearance and international contextualisation – and we were given the chance to finally see (or see again) Balabanov’s shocking and cynical comment on Russia’s near past Cargo 200, Aleksandr Sokurov’s sublime, enigmatic post-political comment on Russia’s presence Aleksandra, but also the grand old lady Kira Muratova’s latest manifesto in weirdness, Dva v odnom (Two in One), an ever-so-ecstatic diptych of great idiosyncrasy and style, a contemplation on death and love, generations and sexes, relation and confrontation, starring a handful of the country’s most excellent faces, Bogdan Stupka, Renata Litvinova, or Aleksandr Bashirov. Last but not least, there was the personal retrospective of Svetlana Proskurina’s films, one of two absolute program section highlights of the festival (the other one being the fantastic and long awaited retrospective of the “Chinese 4th generation”, which I am going to turn to in a moment). In contrast to the focus on Kobayashi Masahiro, whose earlier works Closing Time (1996), Bootleg Film (1999), Aruku-hito (Man Walking on Snow, 2001), Kanzen-naru shiiku: Onna rihatsushi no koi (Amazing Story, 2003), Flic (2004) and Bashing (2005), displayed many of the (“Truffautian”) stylistic and idiosyncratic features also dominant in The Rebirth (tameless desire, wintry desolation, silent humans), but doesn’t yet possess the same inner flow, surreal psychological depth, and exorbitant temporal intuition of this new film, the screening of all six of Proskurina’s feature films and one TV-documentary – on her soul-mate Aleksandr Sokurov – unfolded a whole small universe of extraordinarily strong individual films, each dealing with the human psyche, its heavenly heights, its abysmal depths, but more than anything with its nuances so hard to describe and narrate, that the only possible way of rendering them on celluloid is by the mastery of sense and sensibility. 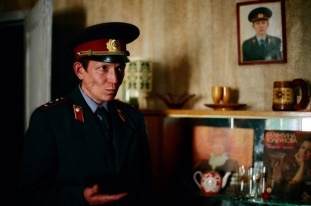 Already her first (short) feature, Roditelskii den (Parents’ Day, 1982), like in all other films of the first working period between the early ‘80s and the early ‘90s starring her then-husband Viktor Proskurin, proves of a tremendously confident cinematographic mise en scène and of an experienced handling of visual and sound techniques; the intensity of the story (a child of an earlier marriage, now a teenager, visits her father and threatens to destroy the fragile family settings) is mediated solely by the language(s) of cinema, the reduced dialogues functioning as just another device of generating atmospheres. Proskurina’s three major films of this first period thus represent a multifaceted elaboration of these genuine skills and intentions: Detskaya ploshchadka (Playground, 1986), a late socialist komunalka-love story between two teenagers who want to simply live their lives of a new generation among the strict behavioural settings and codices of the typical Soviet backyard society; Sluchainyi val’s (Accidental Waltz, 1989), the structurally loosely-knit camera flight right onto the faces and bodies and into the interior and surroundings of the life arrangements of the specific perestroika-generation, precisely displaying this chrono-topos in which a multitude of psychic states and social relations seemed possible (and unavoidable); and Otrazhenie v zerkale (Reflection in the Mirror, 1992), Proskurina’s only attempt in trusting (and exploring) the metaphysical nature of the world, an enigmatic dive into the world of theatre and masks, reflections and mirrors, crisis and depression. Proskurina’s latest film Luchshee vremya goda (The Best of Times) is a bright version of a similarly dark (or at least intense) story and probably the most explicit in terms of complex construction, drawing the dense picture of a spiritual love story as almost ancient tragedy between a man and two women at the age of 20, 40 and 60. The highest form, however, of this masterly demonstration of the skilful interaction with actors and actresses, but also with the mature and subtle arrangement of psychological atmospheres by a balanced confrontation of sound, colours, set design, camera movements and minimalist narration, remains Svetlana Proskurina’s first (unfortunately ignored) Venice-appearance Udalionnyj dostup (Remote Access, 2004), the clear-cut depiction of a nouveau-russe-family on the edge of existence, tumbling between utter adaptive professionalism, cold hearted intelligence, and eruptive as well as constantly repressed electronically mediated emotions – a film about trauma, gender and generations, a melodrama against its genre-roots and settings, a deconstruction of usual narratives, an exercise in the possibilities and the depths of communication, a masterpiece of virtual encounters in a world which no longer offers (and actually never had offered) any form of home, any kind of identity with oneself or the other(s). If Proskurina’s psychological films allowed an analytical and also a socially and politically important insight into the decade(s) of Soviet/Russian perestroika, the second special program highlight of this year’s IFFR, Cinema Regained: Rediscovering the 4th Generation, curated by Shelly Kraicer, delivered a widespread and reflexive glance at the cultural landscape(s) of China during and after the so called Cultural Revolution. “The Great Proletarian Cultural Revolution (1966-1976) extended into and disrupted every social and cultural aspect of Chinese society, including cinema, which was given special scrutiny from the beginning of the People’s Republic, as a medium with the greatest possible propaganda value. These ten years began with a total cessation of film production”, Kraicer explains in his introductory article for the festival catalogue. The Fourth Generation was named retrospectively at the moment when it became necessary to distinguish this therefore randomly connected group of filmmakers from the ones working in the post-Liberation period (1949-1966) and those who regained international fame as the Fifth Generation (Zhang Yimou, Chen Kaige and Tian Zhuangzhuang among others). Generation Four appeared “in silence”, Dai Jinhua remembers in the second longer catalogue text, arguing “it is only in retrospective that they turn out to mark the historic break in recent Chinese history.” In terms of stylistics the twelve films shown in the retrospective thus bear only little resemblance to each other. What the represented directors share, however, is the weird and in most cases tragic fate of studying and intending professional careers (as fellow students of the first generation trained at the Film Academy in Beijing) during a time restricting every step outside the arbitrary, ridiculous framework of the Cultural Revolution. It may be paradoxical, but the films, mainly a Europe- (especially Bazin-) inspired cinema d’auteur produced between 1979 – Xiao hua (Little Flower by Huang Jianzhong and Zhang Zheng), Kunao ren de xiao (Troubled Laughter by Yang Yanjin) – and 1989 (Ben ming nian/Black Snow by Xie Fei), are truly revolutionary themselves in the sense that they reveal the anti-revolutionary character of the ten years of outspoken cultural and human catastrophes. The methods of this revelation were multiple, the topics of the films manifold. The most pompous one – probably not only in this program section but the whole festival – Xiao hua, for instance, an aesthetic sledge hammer with the air of a soft lotus blossom, a radical fusion of melodrama, romance and war epic, seems more like a straight continuation of the patriotic war genre and ideological dogmas at first glance, and only smoothly, even covertly, turns into a subversive reflection of old ideas and clichés (before it ends in utter heavenly erosion – or maybe self-destroying apotheosis … of Socialist Realism). This too-good-to-be-true story about two girls called Little Flower – in Jia Zhang-ke’s latest film Er shi si cheng ji (24 City), by the way, the film becomes a major point of reference: a fabric worker is called Little Flower, too, because Joan Chen who plays the roll, looks just like the Little Flowers in the famous war-epic from 1979 – their growing up in poverty in the 1930s and their sacrifices as silent war heroines in the ‘40s, is a masterpiece of orchestration and verve, a veritable colour epiphany, aesthetically matched by no other film of the series. There were other examples of extraordinarily great direction, however, like the two 1983-flag ships Mei you hangbiao de heliu (River Without Buoys) by Wu Tianming and Cheng nan jiu shi (My Memories of Old Beijing) by Wu Yigong. Three men sailing down a raft on the Xiao River during the Cultural Revolution – this simple framing generates Wu Tianming’s sensational narrative in which every going onshore turns into a new breeding ground for the little man’s outrageous fate at this time. Farmers and workers, men and women, every average citizen seems to have become a victim of Mao’s radical ravage. Along with the trip the crew members tell and live their individual stories, unfolding hereby a broad spectrum of classes and the recent history of China. 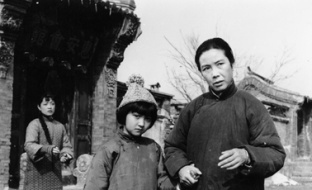 Of similar pureness and simplicity in style, less dramatic, more lyrical, however, is the other historical panorama My Memories of Old Beijing, a masterpiece of Chinese cinema. The emotional but never sentimental attitude of this epic is created by the fact that the threefold chronicle is told through the eyes of a curious and serious little girl, pulling together the strings of a young madwoman’s, a young thief’s, and her own family’s story. Like in River Without Buoys we learn about different social classes and historical constellations by an elegant interweaving of timelines and hardly noticeable (but therefore even more significant) shifting details in narration. The cinematographic maturity displayed in the two Wus films on spatially (rural) and temporarily distant Chinese livings was contrasted by the sharp irony and direct political critique of the Cultural Revolution’s corrupt and destructive force in Cong Lianwen’s Xiao xiang mingliu (A Narrow Lane Celebrity, 1985), the black-humorous depiction of the years during and after the fatal period in the urban micro-cosmos of a “narrow lane”, and Ben ming nian (Black Snow, 1989), a Berlin Silver Bear, Xie Fei’s realistic hand-camera portrait of a guy returning to Beijing after imprisonment, trying to gain ground as a private market entrepreneur. Naturally he fails to go straight and is drawn back into the world he was determined to leave forever. The film is shocking in the way it delivers a raw insight into the shabby biotopes of a bleak underworld, where no niche is accessible for life without despair. It really stood out in aesthetics, too, foreshadowing not only the many realistic urban documents by the Sixth Generation, but also casting a future glance at what was to become one of the deepest cuts in Chinese history (the suppression of the 1989 Tiananmen Square movement). A different type of realism, maybe slightly more prone to story telling but nevertheless almost as documentary in style is the wonderful Yeshan (In the Wild Mountains, 1985) by Yan Hueshu. With its long takes, its peaceful framing, its stunning lighting, this husband-swapping drama about two families living their lives within the ancient settings of rural China (the Shaanxi province) – and yet breaking out of the system – became an absolutely striking film experience for many (and one of my personal festival favourites!). Told smoothly, almost as if avoiding to interfere in the harshness of the domestic order and the individual strength of the female characters (the men tend to be losers, generally), Yeshan never fails to keep hold of the small details of real-life-matters, including the physicality of eating, the togetherness of animal and man, or some astonishingly open references to eroticism. To me it seemed even stronger than Teng Wenji’s much appraised Haitan (At the Beach, 1984), the symbolically (over-)loaded other rural family melodrama, set in a fishermen’s village and boosted with really crazy occasional sci-fi tunes – an allusion to Godard, maybe even Tarkovsky, in a small world defended by a Fisherman King and his gang against the new satellite town arising on the horizons. Strange modernist imagery and experimentalism also seem to be predominant aspects in Yang Yanjin’s works, Kunao ren de xiao (Troubled Laughter) from 1979 on the one hand, and Xiao jie (The Alley, 1981) on the other. Whereas the first, one of the earliest representatives of the Fourth Generation, is the hilarious deconstruction of the perversities and absurdity of the years of the Cultural Revolution, the filmic disruption (slow and stop motion, colour effects, rapid-fire montage) and a confrontation of the naïve and the corrupt, the latter is a playful, yet meditative gender-switching film-in-film-in-film allegory, the un-intentionally therapeutic re-telling of a love during the troublesome years in recent history. 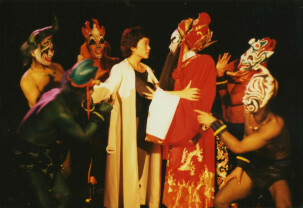 The same estranging dream-passages, a similar merging of different layers of reality, and modernism at its best can be found in Huang Shuqin’s Ren gui qing (Woman Demon Human, 1987), by far the weirdest and visually most daring of all presented films, and together with the second female director’s chef-d’oeuvre, Zhang Nuanxin’s Qinchun ji (Sacrificed Youth, 1985), the absolute double topping of the amazing heights of Rediscovering the 4th Generation. Based on the life of the female Beijing opera star Pei Yanling the protagonist of the film, famous for portraying male roles on stage (Zhong Kui, for instance, the ghost-catching underworld god), soon identifies with her father and thus seems to start challenging traditional Chinese gender models all life long. It is not only the famed ecstatic scene, when she encounters her alter ego Zhong Kui in a dark abstract room full of mirrors and reflections, but also the elliptic narration, the subtle yet fierce story, and the several cross sections it allows through Chinese history that make Ren gui qing a masterpiece and meta-comment on the actual cultural revolutions taking place during the Cultural Revolution (figuring as a prominent blank here, the most radical rupture in the artist’s biography). The touching sequence (taking place after 1976) in which the actress lives as a caring working mother, slowly withdrawing from the revolutionary model opera business – a direct allusion to the fact that almost all directors of this period had started out assisting the recording of this standard genre of Cultural Revolution Art – is the strongest connection (in style and in attitude) to the features elaborated and displayed so magically in Zhang’s Sacrificed Youth, one of the greatest films ever (if someone who likes superlatives anyway may say so without getting completely untrustworthy). What becomes visible here is not only the general alternative humanism proposed by the Fourth Generation, but also its thaw-inspired disposition, its passionate but at the same time careful handling of the idea that art should serve workers, peasants and soldiers exclusively, its love for but at the same time cautious retreat and alienation from the Chinese socialist system, its longing yet discreet desire for a another life, its silent and contemplative concern for the many tragic and destructive forces striking this generation of hope – the culturally and politically engaged intelligentsia of China. Qinchun ji is singular in the way it depicts a young woman being “sent-down”, that is, expelled from the city to the countryside in the idyllic Yunnan province, her life with the new and poor Dai minority family, her reluctant but ambitious and humble way of adjusting to the hard labour and the ancient folklore traditions of the community, her reflections upon this arbitrary act of dislocation and the new sensual experiences that came along with it. It is the inevitable (and ideologically probably even intended) reciprocity between rural minority – filmed with an astonishing, for the time shocking naturalism – and the sent-down urban intellectuals, their unavoidable communication and contact which makes the young woman’s experience and with her the whole fourth generation’s fate so special. They sacrificed their youths, their hands were bound when they had reached the height of enthusiasm and lust for life, they suffered from being restricted and thrown back; but somehow, later, being already in their thirties and forties mostly, they were able to discover and lay bare the natural beauty and the inevitable evil, the idealist truths and the constitutive conflicts, the enchanting personal desires and the vicious social constraint in this hilarious, ambivalent, contradictory, estranged world, a world bureaucratically established by a historically singular political intervention, a world they were doomed to live in. They lived in it, they worked in it, they suffered in and with it, they hated it, they loved it.